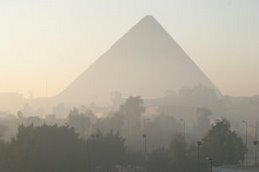 Thanks to Jane Akshar for posting the above link on her Luxor News blog. David Rohl's theories have attracted a great deal of controversy but if you are interested in his work he has posted some of his articles on the above website. Talk about a crackpot, this is your man. If he is an expert on Egypt, I'm King Tut. An obviously erudite and intelligent comment from an anonymous twit who has delusions of grandeur. King Tut would have had nothing to do with such jerks. When people start calling others crackpots it usually means they have zero intelligence and can't articulate beyond a pathetic insult. David Rohl has degrees in Egyptology and Ancient History and can hold his own against the best that Egyptology can offer - as he has demonstrated on several occasions in public debate. A "New Chronology Group" was created on Facebook. Anyone interested, please feel free to join and comment. Why isn't Mr Rohl teaching somewhere? And doing excavations in Egypt or Israel? His TV series was fantastic as was his book except now, after 15 years it needs an update. He has revolutionized the chronology and made sense of so much confusion. In the days when I was in Seminary studying "Biblical Backgrounds" it actually occured to me as we read about the "Habiru" that perhaps the dates might be wrong. And Rohl figured it out...and most convincingly. I just wish he would re appear in the academic world and continue the verification process without getting too off track with other projects. Now that david has found eden, and I believe he's right.I wish he would take a stab at finding hell, which I believe was also a real place in the middle east.